Lovelies, our insanely talented costume designer cousin, Kate, is here this week with some awesome "Girls Can Do Anything: Halloween" posts! Okay, I wasn't even going to do a Harry Potter-inspired costume board (those who know me know I can go ON about all things Potter), but then this awesome green coat popped up and it led to all kinds of inspiration. 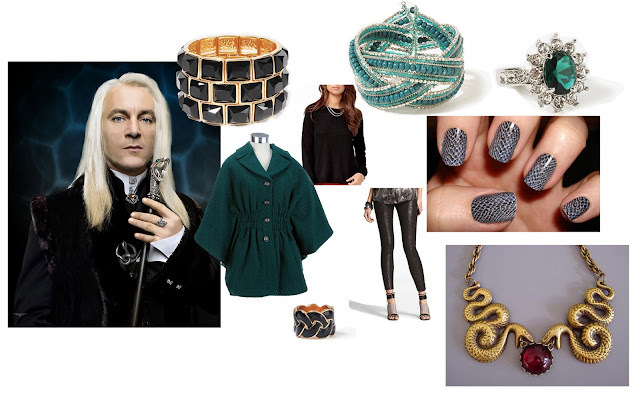 So this Halloween, channel the Dark Side (of the Wizarding world) with Lucius Malfoy, the aristocratic, green-loving, blinged-out father of the HP's very nemesis, Draco. He might be judgmental, cruel, and has enough pride AND prejudice to put Mr. Darcy to shame, but he also has some pretty fabulous style. Plus, Halloween is the perfect time to showcase your inner villain (and the perfect time to finally buy that Marcia Brady wig you've been eyeing). 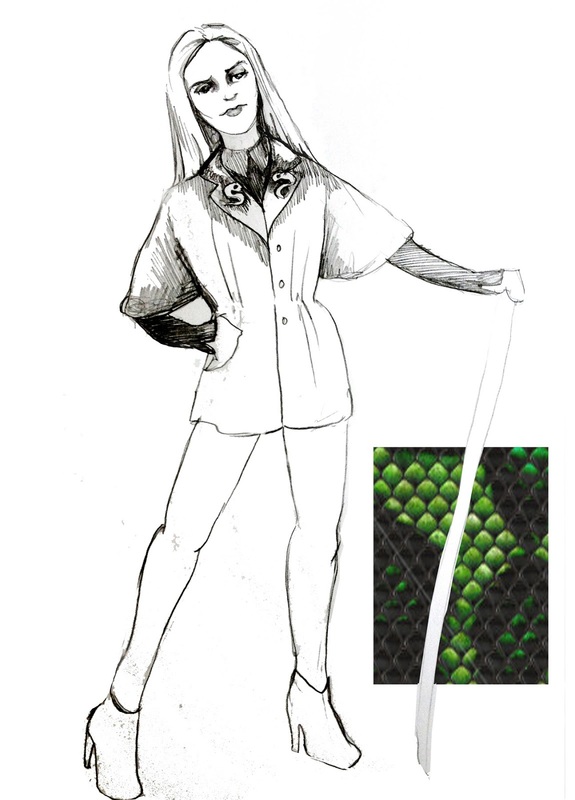 Stay warm and cute with a dramatic emerald cape with a cinched waist; slip on some snakeskin leggings, and bust out the costume jewelry (multiples, like stacked bracelets and several rings, gives this costume the glamorous impact it needs). Bonus points if you have a snake-tipped cane! So embrace the luxurious textures, deep green and onyx black, and luxe snake-inspired jewels (don't forget to enhance this great coat with a few, too! ), and arrive in Dark Wizard style.